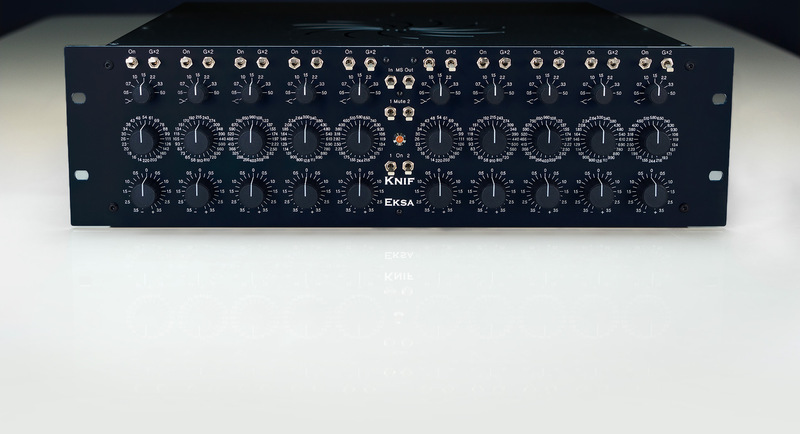 Eksa is an exercise in ultimate purity of sound, and unlike all other Knif products, it is not tube based, but uses in-house designed and produced class A discrete OP amps. It is also the perfect companion to Soma, which excels in the beauty of sound and has an enhancing nature, whereas Eksa gives precision, wide Q value range and much more frequencies. There are 24 discrete operational amplifiers in Eksa. They use jfet inputs and outputs, and always work in class A. There are 2 op amps for the basic signal route, and 2 op amps for each band per channel. There are also DC servos for each band and the basic amps. The servos are tuned very low, so that their effect on audio range would be minimal. The time constants are more than one minute, and the servos use high quality OP amps and polypropylene caps to further improve the situation. And like always in Knif gear, there are no potentiometers, just Elma rotary switches.